A Gold Coast company is attempting to foil tobacco plain packaging laws by creating wrap around stickers for cigarette packs. 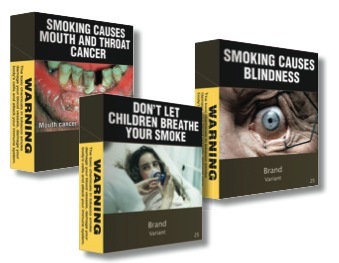 Box Wrap, a sticker manufacturing company, created the workaround for smokers who dislike the mandatory olive green packaging and gruesome health warnings, which came into effect on cigarette packs on 1 December. “People feel they have had their choice ripped off them. We are just a sticker company that is no different from a cigarette case,” says the company’s managing director Anthony Do Rozario. Box Wrap will launch a website and social media campaign for the stickers today, according to the Gold Coast Bulletin. They will initially be sold online for $8.75 for packs of six, with hopes of making them available alongside cigarettes in retail outlets. The company has filed for a worldwide patent for the stickers, as other countries consider introducing similar laws. The Federal Government’s Department of Health and Ageing is yet to respond to questions over the legality of the stickers, but will certainly by looking at them closely.